Gay marriage: RNC member distributes list of threats homosexuality poses. 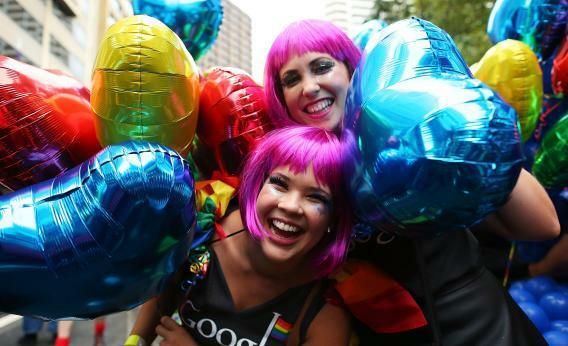 Parade goers dance prior to the start of the annual Sydney Gay and Lesbian Mardi Gras Parade on March 2, 2013 in Sydney, Australia. Dave Agema is a Republican National Commiteeman from Michigan, one of the state’s three avatars in the organization. His successful campaign for the job told voters that there “simply weren’t enough conservatives” in the RNC to challenge “the big government Republicans.” He gets to vote on party bylaws, on the chairman—stuff like that. And he’s not really on board with this kinder, gentler Republican Party jive. 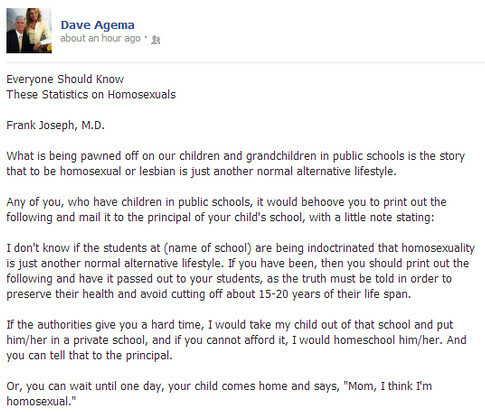 A source points me to Agema’s Facebook page (viewable only to friends), where Agema has shared a semi-viral list by “Frank Joseph, M.D.,” all about the threats posed by homosexuals. You can read the whole article at this link; it asserts that “part of the homosexual agenda is to get the public to affirm their filthy lifestyle,” that “homosexuals aren’t discriminated against in employment,” and that “Homosexuals account for half the murders in large cities,” among other fun factoids. Agema hasn’t responded to a call or email about the post, but he’s spent part of his career trying to eliminate domestic partner benefits, so I doubt anybody’s pulling a fast one on him.